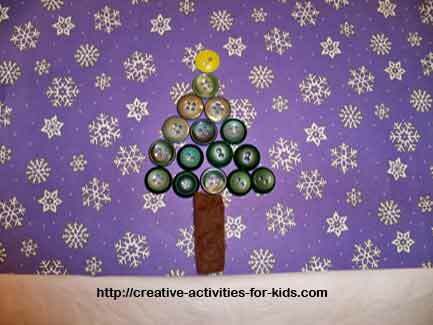 Use your green buttons to make this beautiful and fun winter scene! Once you try this project your kids will imagine many more fun ways to use buttons. This is a great project for winter crafts or Christmas crafts. Create! You can use cotton balls or white paper at the bottom of the page for snow. If you are feeling extra creative make a snowman. You can also add people if you would like. I have made smaller versions of these and used them as gift tags and greeting cards. Did you like making the winter scene? There are more snow themed ideas here!